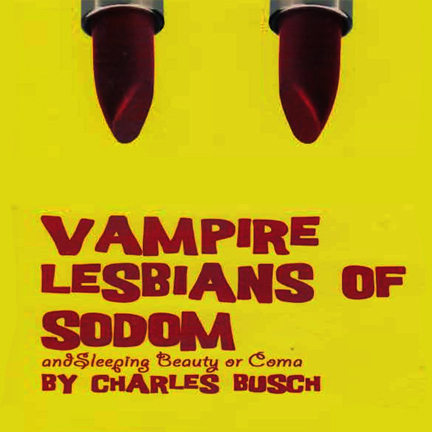 First performed at the Limbo Lounge in New York City's East Village in 1984, it became so popular it was moved to Off-Broadway and ran five years at the Provincetown Playhouse, one of the longest running plays in Off-Broadway history, “Vampire Lesbians of Sodom” tells the saga of two fatally seductive vampiresses whose paths first collide in ancient Sodom. Their bitter rivalry as bloodsuckers but more importantly, as actresses, endures for two thousand years with stops along the way in 1920’s silent movie Hollywood and contemporary Las Vegas. Performed along with its companion piece, “Sleeping Beauty or Coma”, the classic fairy tale retold in the sixties mod London fashion world.